10Bet is a multi-product online gambling site that has been in operation since 2003. It offers players the chance to make sports bets or play casino games with a computer or human dealer. The site is owned by 10Bet Ltd and is based in Malta. Interestingly, the company has three different gaming licenses. They have received licenses from Curacao, Malta, and the UK. While the Malta and UK licenses require a significant amount of due diligence to acquire (and in the case of the UK, you cannot accept players from that country without approval by the Gambling Commission), the Curacao license seems to be unnecessary at this point. Back in the days of being able to take U.S. play, operators lined up to acquire licenses from this gaming-friendly jurisdiction, but these days, the other two licenses hold far more weight. While it seems that in their early days, 10Bet may have had some U.S. players (even if they weren’t focused on attracting them), today there are restrictions placed on the company by the regulatory boards. Unfortunately, this means that Americans are no longer able to play at this site for real money. Is 10Bet Legit for U.S. Players? We cannot give this site a “legit” rating for U.S. players, because they can’t play for real money. We hope that one day we will be able to change this part of our review, but for now, we are not holding our breath. 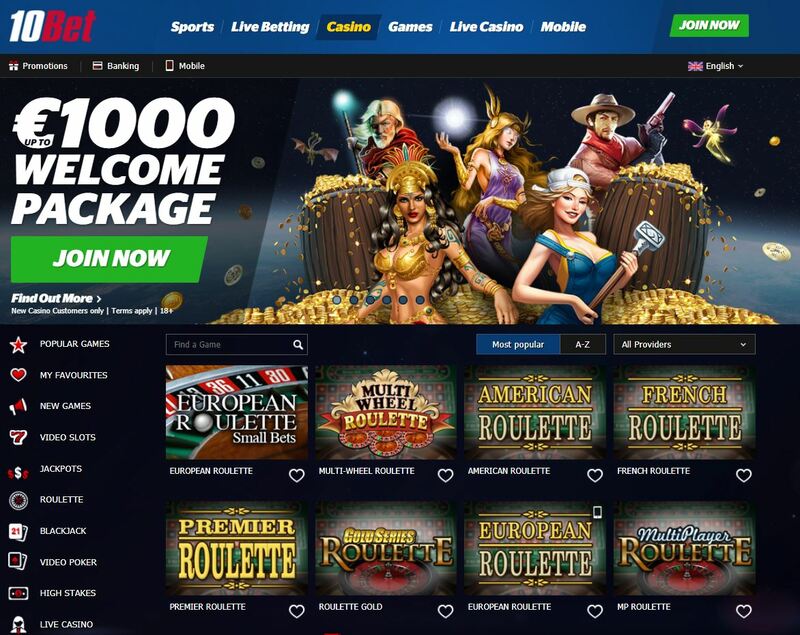 Of course, you won’t find all the content from each supplier in this casino; they have cherry-picked some of the best from each to provide you with the best overall gaming offering. These games are all available in no-download mode, accessible from your browser. Many of the games have been formatted to fit your mobile devices, so playing on the go is an option here as well. The casino also has a lot of progressive jackpot machines. While these machines pay out slightly less on a per-spin basis, they take that extra money and pool it into a jackpot that can in some cases reach over seven figures before it is triggered! 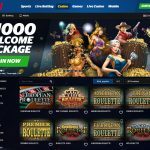 Recently, 10Bet has jumped into the Live Casino game with their partnership with Evolution Gaming. This company is focused solely on Live Dealer games (ones where a dealer is being streamed onto your screen from a studio in Europe), and this is shown through the quality of the offering. Microgaming does the heavy lifting when it comes to the video poker catalog, and that is very good news for players. The folks at Microgaming have a great selection of variants available to play; they definitely have more than the other providers that 10Bet uses for the rest of the casino. You can try out video poker for free if you want to understand what all the excitement is about. 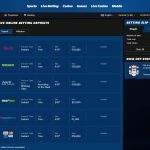 When it first launched, 10Bet was primarily a sportsbook, and that can be seen in the quality of the product offering. The software they are using is robust; it looks like they can handle hundreds of concurrent sporting events across the globe without issue. 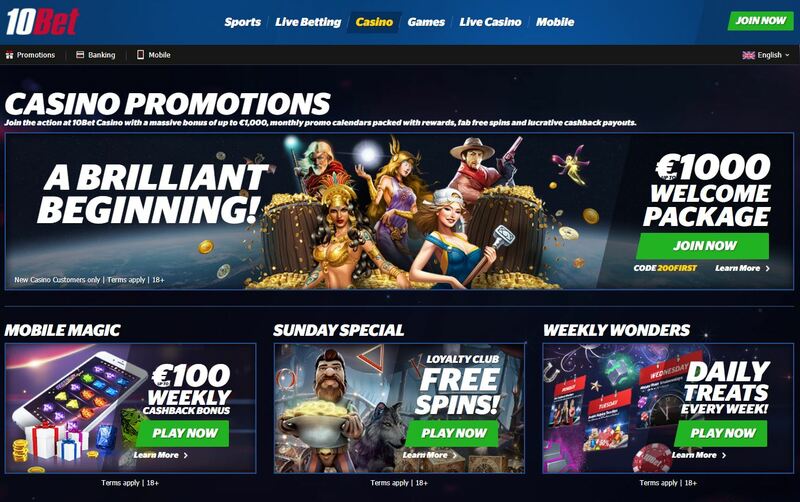 Also, we investigated the betting types that are offered by this site, and we can confirm that essentially any type of bet you want to make is possible. We are thrilled to see eSports listed as a category; the video game competitions are heating up around the world, and betting on the outcomes of these matches is some of the most exciting action we have ever encountered. Also, as the average age of an eSports fan is much lower than that of fans of traditional sports, it is a way for operators to attract a younger audience to their site. 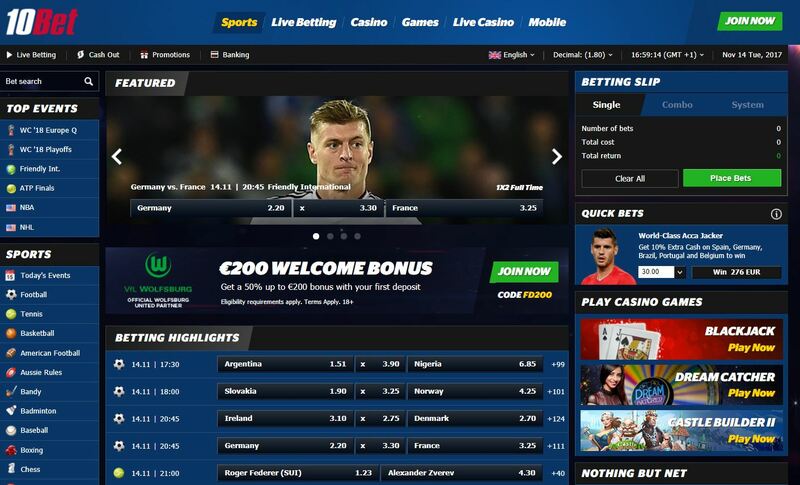 With their Live Betting options, 10Bet offers its customers the chance to bet while a game is in play. If you are watching a slow soccer match and want to make it more exciting, you can add excitement by betting on things like which player will score next, what time a goal will be scored, etc. This is all made easier with the mobile website, which gives you instant access to your account from your phone. You can reach 10Bet’s support team 24 hours a day via Live Chat, Telephone, and Email. Since there is no toll-free option for phone calls, we suggest that you connect through the Live Chat function, which you can find on each page of their website. When you make your first three deposits at 10Bet Casino, you will receive up to €1,010 in total bonuses! The minimum wagering requirement is 35x for these bonuses, and when you receive your cashback, it also has a playing requirement of 25x. 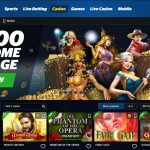 Get up to a €50 Live Cashback Bonus! Get a 50% Bonus + 20 Free Spins! Enjoy your €50 bonus and 20 free spins on ‘STARBURST’! Get a 100% Happy Hour Bonus! Get this offer Wednesdays between 19:00 and 20:59 CET! Get 10 New Thrilling Free Spins! Try out the New slot: ‘JOKERPRO’ with 10 free spins before 16:00 CET! 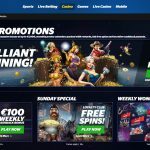 Get a share of €500 in No-Deposit Bonuses! Play the “Game of the Week” to take part in the special bonus draw! 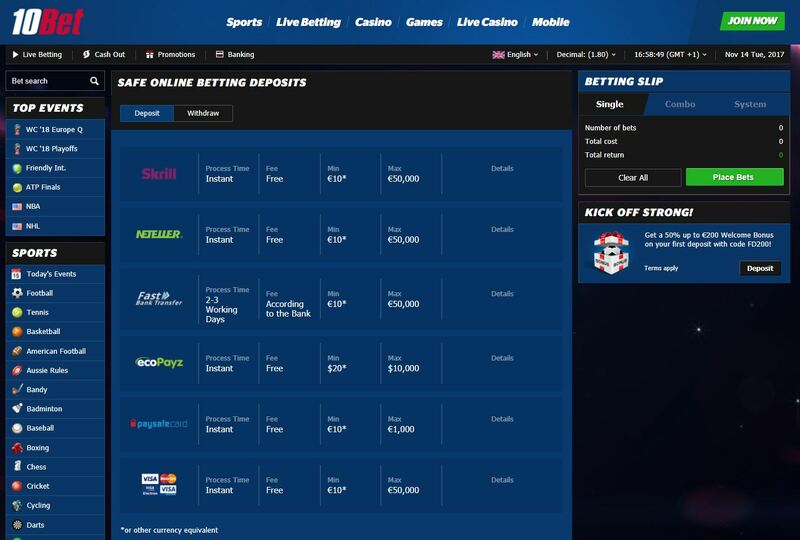 At 10Bet, you will find most of the standard European-facing payment options; these are all excellent, but the e-wallets tend to be the ones that get money back to players the fastest, so we usually recommend those options first. 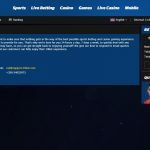 While we have read on some forums about players who are VIPs at 10Bet, there is no information about a standardized program on their website. This typically means that the casino hand-picks who they deem to be a VIP and contacts them directly. If you are playing and want to know the criteria they use (or if, in fact, there is a VIP program at all), you should contact the casino directly. 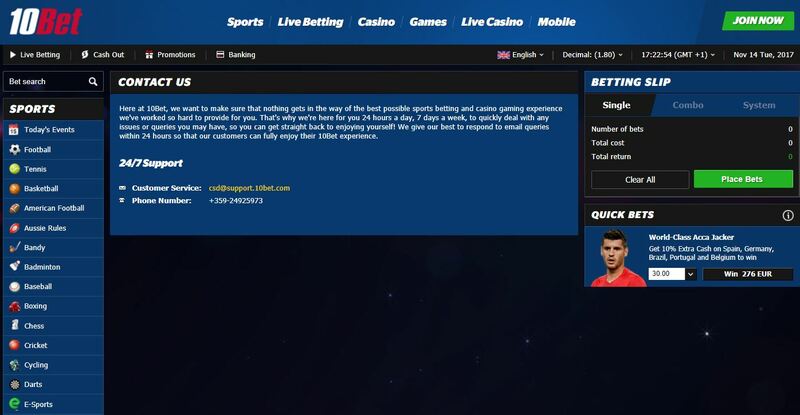 10Bet has been around for a long time, but that doesn’t mean that their site has gone stale. In fact, by adding so many different casino software partners, along with a Live Dealer option, this site is just as fresh as many of the newer competitors. 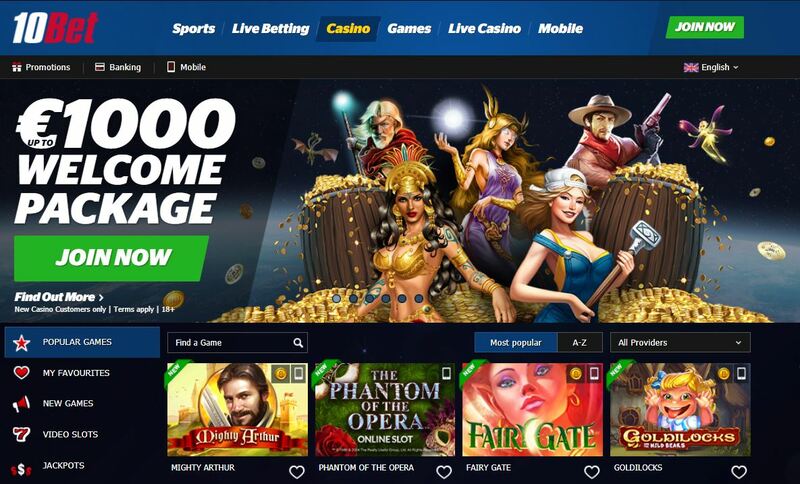 We like that you can bet on sports as well as play your favorite casino games here, and despite some older payout complaints which seem to have been dealt with, we are confident that you will have an excellent experience using this brand.